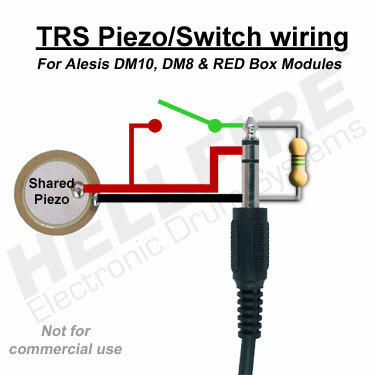 Unfortunately, the Alesis DM10, DM8 and Pearl REDbox can not have velocity on a switch zone of a piezo/switch dual zone trigger pad. This video shows that it is possible to use a piezo/switch trigger and have velocity on the switch zone. You will need to make your own trigger to make this work. It is important to note that piezo/piezo trigger must be selected in the trigger settings for this to work. Off the shelf piezo/switch triggers will not function in this way. I will be posting this info over at www.Hellfiredrums.com as well. See attached picture for hook-up information. I have an Alesis Trigger IO. Can it be done to this module as well? I haven't done any testing with the Trigger I/O yet, but I don't see why it can't be on the Trigger I/O. Thanks, Hellfire. I'm gonna check it soon, then I'll post any results. Yep, This works on the Trigger I/O as well. hmmm, so with some fiddling it looks like we could get a velocity sensitive bell on a ride? Nice! I assume you mean the plastic/rubber ride cymbals, because the surge cymbals use a piezo on the bell already. I'm not sure you can convert your ride to work this way. I stated in my full article on Hellfire drums that I tried to convert a Roland CY-6 (which uses similar switches as the bell in your ride) and couldn't get it to work. That is not to say it won't, I just could not get it to work on the Roland. I assume it has to do with the type of film switch. A lot of commercial film switches have a built in resistance (because of the material they are made from). My aluminum switch doesn't have that resistance). You can always try convert your ride cymbal if you wish (at your own risk), but keep in mind it is more than just tweaking the module to get it to work. You would need to physically modify the wiring in your ride cymbal. I hope that helps. Velocity Switch Zone Triggering concept is also great for a 2 zone snare(and toms) ,using only one piezo(and 2 inputs on the module).I have mesh heads and I am near the achievement of positional sensing but only through software...With a switch for the center zone I can (theoretically) eliminate crosstalk but I have to find a way for disabling the edge zone when the switch is on.However there would be problems when striking both edge&center...I have a DM5 module and will start the built first thing in the morning!Thanks! PS.By adding the resistor ,isn't the piezo sensitivity reduced? Very, very slightly. Since it is a large resistance it isn't very noticeable. I hope that helps. Ahh I must of missed it somewhere that the two different rides were built differently. I do have the the rubber/plastic versions. I wonder how hard it would be just to replace the switch with a piezo. I'll put that off until I actually "have to" replace the switch. Thanks Hellfire. How do you know whether a piece has piezos or switches? Is it in the manual, a published spec somewhere, or maybe someone has assembled info into a database? Not only the pads and cymbals, but it seems modules are set up differently for, and react differently to, the two types. Same questions apply to modules, I guess. Also, is the main reason why piezos are preferred, is that they're velocity sensitive, while the switches are not? Lots of questions, I know. But I'd really like to understand this stuff better. So since you said this method works on a Trigger IO, could it be possible to use a modified Yamaha PCY135/155 cymbal and get velocities for the bell and edge switches? You'd end up with a three-zone cymbal with all zones having velocity-sensing. -Un-map whatever note the piezo (not the switch) on the edge trigger is mapped to. The only thing I can see being an issue is wiring the pizeo to both jacks, because I don't know if it can actually be done or not. Oh, missed the part about built-in resistance and got a bit ahead of myself. I'll probably still pick up some yammies for my new build, and if my experiment doesn't work I'll try to write an application using loopbe to mimic the setup host-side with MIDI.